It was like Christmas in the Kaplan household today – if we actually celebrated Christmas. 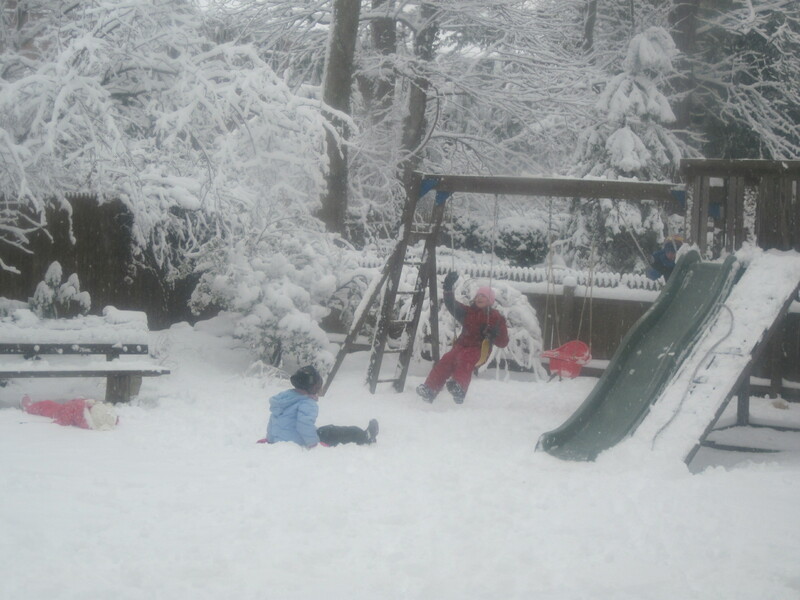 The kids were up by 8:00, raring to get out into the snow. 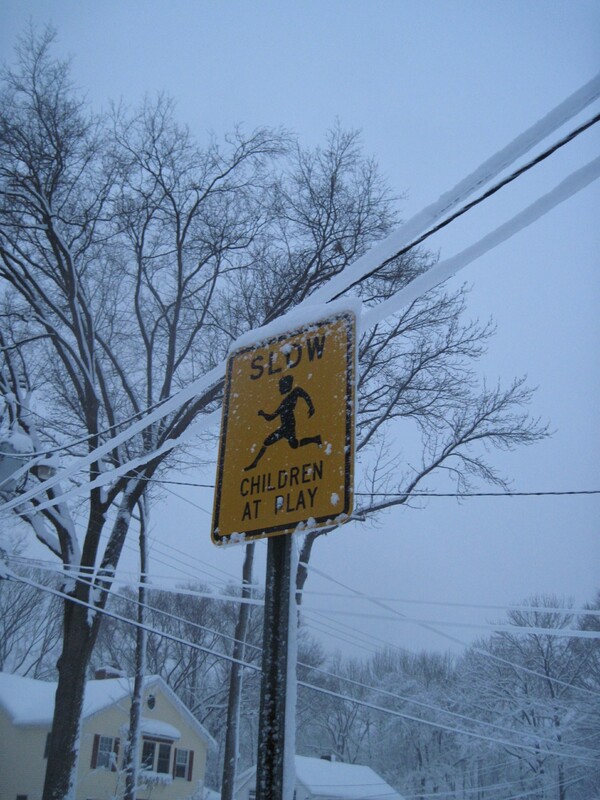 Fortunately, our neighbors were out playing in the snow by 8:15 a.m., so like a good mom, I let the kids go out there with them. Then I caught up on email and Facebook in my robe, while the neighbor parents helped the kids build snow forts. I felt a little badly the kids hadn’t brushed their teeth yet, or eaten breakfast. But it turns out the neighbor kids had their pajamas on under their snow pants, so I’m not such a bad mom after all. Then the same neighbors plowed our driveway and sidewalks with their snow blower. We scored with our neighbors! We were so happy with them, we took their kids into our house the rest of the day and fed them lunch, homemade snow cones and hot chocolate. The neighbors appreciated this so much they invited us to dinner. It was a veritable love-fest. 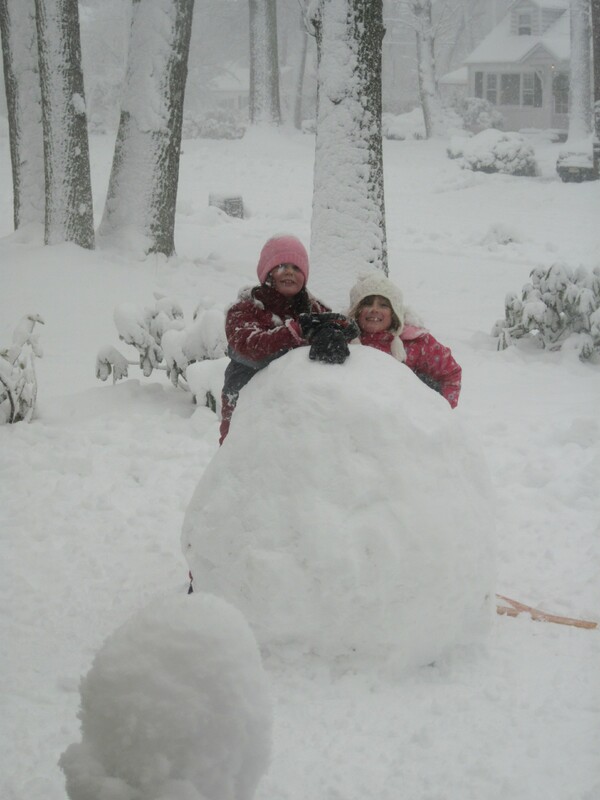 In the afternoon, Dori and our newest neighbor made a 4 foot high snow ball. They’re going to send this photo to the Guiness Book of World Records – because they think it’s the biggest one ever. If it doesn’t make it in there, they’re going to send it to our local paper, which I guarantee will run it – front page. 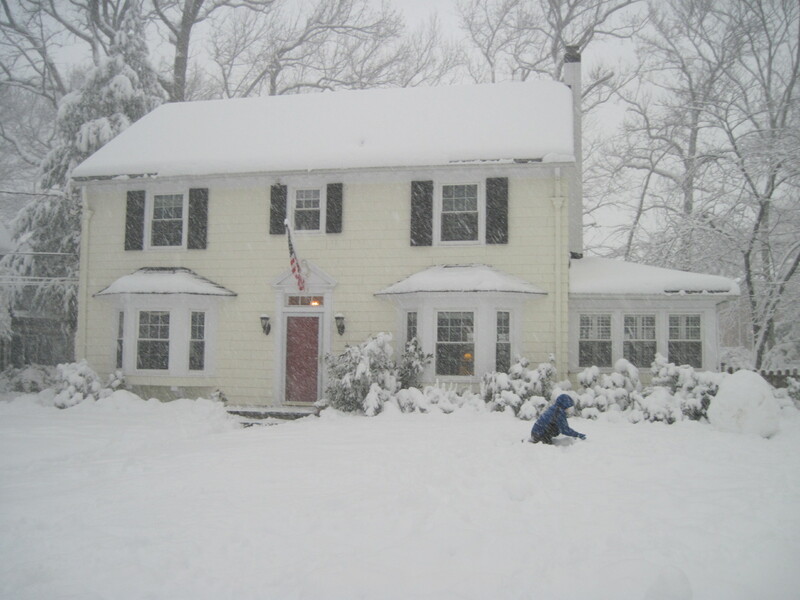 After I dug out our driveway (after the initial snow blowing that morning) we debated the two schools of thought: dig your sidewalks/driveway out continually during the storm because it’s easier, or let it accumulate and do it all at once, which might be much harder. Usually Mark does the shoveling, but you see, he has the flu. 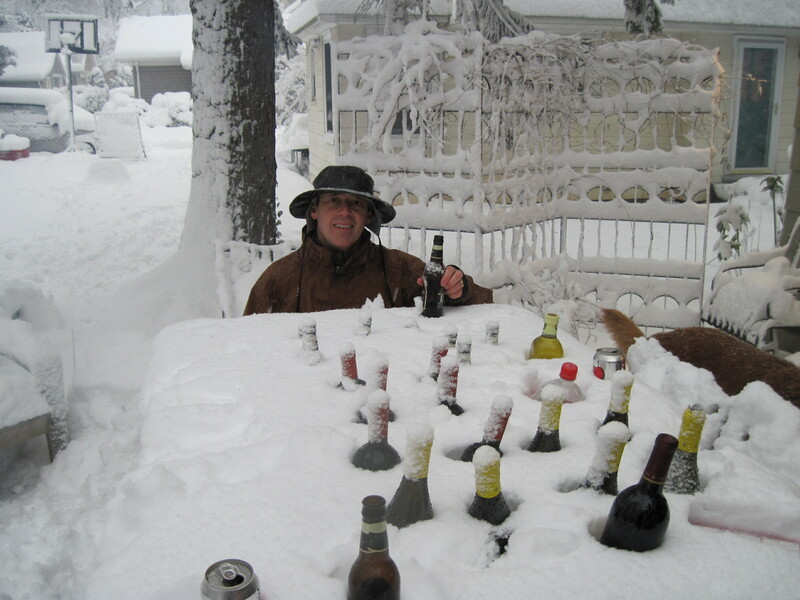 Yes, it’s a snow day and the kids are at home. Convenient, huh? On the flip side, I appreciate Mark’s shoveling so much more now. After we stupidly parked his car in the garage BEHIND the house, we had to manually shovel the entire driveway out twice so he could get it out to go to work tomorrow. Assuming he’s healthy. He stayed home while the kids and I went to a neighbor’s party. 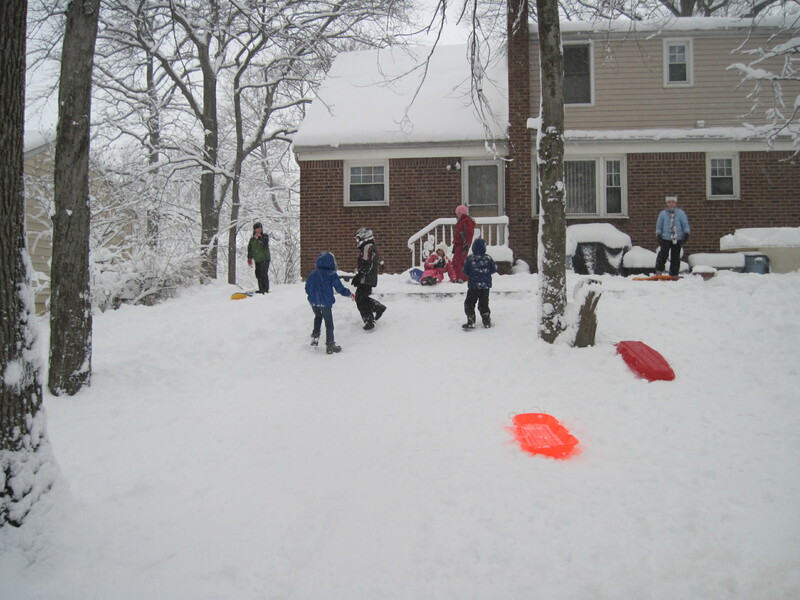 The kids sledded (slight hill – not that it mattered to the kids), while the adults drank. It was awesome! Here’s the homemade bar, and the host. To top off a great snow day, the town declared ANOTHER snow day tomorrow. I could not be more excited. Especially since the near epic storm means my sister/family won’t be coming in on Thursday morning from California – and instead the next flight they can get is Saturday. And I still won’t get work done at home, because my kids will be home. The other piece of good news about the is that the two contractors who were supposed to come today – to fix two broken outlets and our broken washing machine, couldn’t come today – and instead will hopefully come tomorrow. Unless they have another snow day too. In which case I’ll drag the kids back to the laundromat. Or else we’ll take the clothes on sleds to the neighbors, where we’ll continue our drinking-fest. Stay tuned. 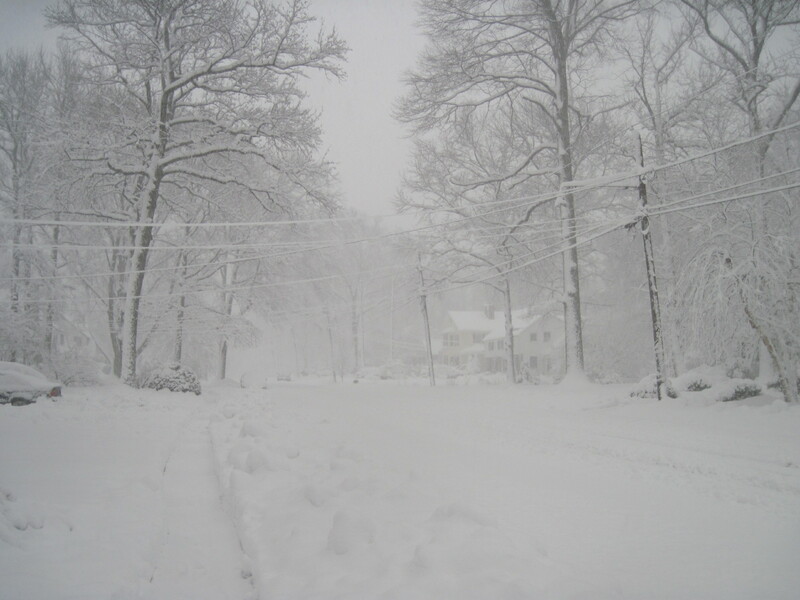 I’m completely jealous of all that snow… It looks gorgeous! So beautiful! (Of course, I don’t have to shovel it!) Looks like a great day, especially that party. Work can wait. Hope you don’t have a deadline. That is clearly the filet of snow day. It just does not get any better than that, ever. Hooray for you all! Woo hoo! I remember that white stuff. In the photos my sister sent from Baltimore, the snow is level with her mailbox. Bundle up. And remember that it’s always sunny here in CA!